God’s wonders and mysteries are revealed! By way of profound, poetic voice, God’s wonders and mysteries are revealed. 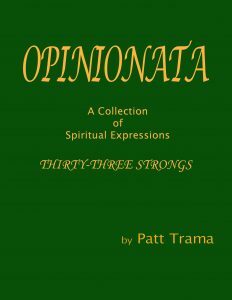 Taste, hear, feel, see and know the impact of OPINIONATA’S strong spiritual interpretations. Who is God? What does God mean? Where can we find God? OPINIONATA answers these questions and offers opportunity to identify how people and things fit into God’s plan for the universe. OPINIONATA shows that opinions do have a point and have place in the understanding of the things of this world. OPINIONATA makes a perfect read. This is the third book by Patt. More to come. Check back soon!